This week I was invited up to Boynton Beach to check out the brand new Earth Fare grocery store. Earth Fare is a health and wellness supermarket with 53 locations throughout the southeast and Midwest US. Earth Fare adheres to a food philosophy that pledges their foods are free of transfats, added hormones, antibiotics, and artificial preservatives and colors. They carry grass-fed meat options, offer locally grown organic produce plus they offer lots of conveniently prepared & grab & go meals but without the extreme price markup you find at Whole Foods – they've got $5 rotisserie chickens on the daily! I wanted to shop for a quick easy keto meal that would be light yet also full of umami-savory Asian flavors, so I grabbed some beautiful sea scallops from their fish department and some organic baby bok choy and put together this quick recipe for you. The secret to all that flavor is the sauce; which becomes keto-friendly with the addition of stevia-glycerite to give it that hint of sweetness. I always recommend stevia glycerite because it does not have that bitter stevia aftertaste that many people don't care for. I always recommend using a seasoned cast iron pan for searing foods as it is naturally non-stick and imparts great color. I get mine at Amazon. Be sure to fully dry the scallops before pan-searing them or they will not caramelize. Make the sauce as spicy as you like by adding more or less Thai garlic sauce/sriracha. I use NOW brand Stevia glycerite from Amazon. The trick to a good sear on these scallops is to gradually sear them in a cast iron pan over medium heat which imparts a crisp surface. 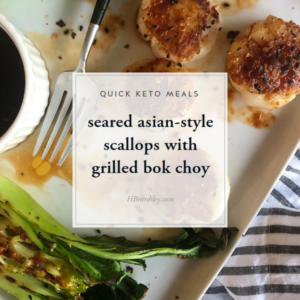 Tamari, toasted sesame oil, and garlic ginger sauce/sriracha combine with a touch of keto-friendly sweetness to pack a flavor punch in the sauce, which is meant to be drizzled over both the scallops and grilled bok choy. Make the sauce by adding all of the sauce ingredients to a medium sized bowl and whisk them together. Taste for your desired amount of sweetness and spice and adjust as desired. Light the grill and season your bok choy lightly with salt and pepper. Clean your grill grates well and lightly oil so the bok choy does not stick. Set aside. Heat a cast-iron skillet large enough to hold the scallops without crowding to medium-high heat. Add a few drops of avocado oil to the pan; just enough to thinly cover. When the oil is just about smoking, turn the heat down to medium and then add the scallops in one layer and let them cook for 5 minutes. Check the scallops as they cook, you want the surface to brown gradually. They are ready to flip when the underside is crisped and caramelized deep brown. Turn off the heat and flip scallops. Leave them in the pan until firm to the touch. While the scallops are cooking, grill the bok choy over medium to medium/low flame until the leaves have wilted and the underside has some grill marks. Plate immediately. 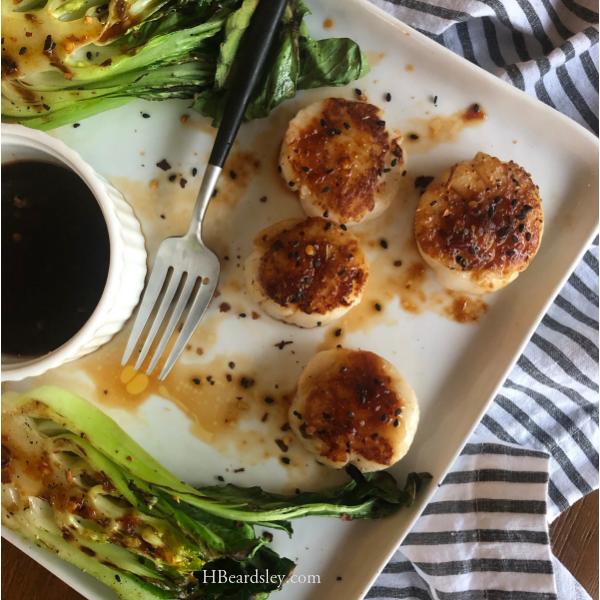 Plate scallops browned side up alongside the bok choy and serve with the sauce. Garnish with extra dried chili flakes and black sesame seeds if desired. This recipe is courtesy of Earth Fare grocery store who provided me with a gift certificate to create this original recipe. All views and opinions are my own.